When you know what you want to do you need to make a schedule. This is irrelevant of it being a goal, a dream or something random that needs to get done. What matters is that it needs to get done. Scheduling the things you have to do not only makes it easier to do them but also gives you an easy overview of what all needs to be done. When scheduling everything it is important to figure out how much time a ‘’to-do’’ takes. For me this has been a process of trial and error, not only because of being wrong about how long something takes me but also how long I want to work on it. 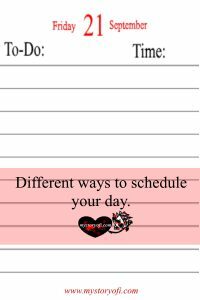 Through this process I have come up with different ways you can schedule your day. Mixing them seems to give the best results. This I find works particularly well with things where it is very clear what it is I have to do. Such as writing a blog post, study a chapter or sort through information. The hour and a half seems to be just enough time to keep me focused without reaching that point of being bored with the task if it were to be a bit tedious. Also knowing that it is just for an hour and a half really helps the focus. Another aspect that helps is even if I were to get distracted there is time calculated in for that. It is precisely why I schedule blocks of an hour and a half instead of blocks of an hour. I’m a serial daydreamer (former ruminator but now I think mostly of fun stuff) so sometimes I find myself a little lost in my own mind. The extra half an hour provides just that extra time to keep me feeling on a schedule as in ‘’get stuff done’’ – mode but not rushed if I were to daydream for five minutes or so. This is the one I use with tasks that are repeatedly the same thing but not necessarily a fast process, when I want to get a lot done of a task or a task that has a few steps. Let me further explain with some examples. A good example that goes for all uses is creating pictures for pinterest. Yes I could get a lot done in an hour and a half but it feels more natural to continue and do it for a full morning or afternoon as I do have several things to do to get to a finished product (sort photos, size photos, add texts, etc). Also it allows me to set a number of pictures I want done. Celebration for completing your to-do list! I know this seems kind of like an old school ‘’duh’’ moment but stay with me. I have a reason why I sometimes only get ‘’one’’ thing done in a day. I schedule just one activity / task a day because it enhances my focus and creativity. I often do this when writing. I plan a full day to just write posts. No editing, no adding photos, no uploading, no nothing. Just writing. I feel that it gives my mind a break from having to switch between tasks a lot. This post is actually one of a two-day just writing binche. I also schedule tasks I could potentially breakdown in smaller ones as full day ones instead of fitting the smaller tasks into my schedule. For some tasks this just feels like the right way to go. For example every Thursday I would do all my school stuff. Yes this sometimes was for different classes, however as a lot of my classes use the same knowledge it overlaps nicely. I combine the different ways in order to create a schedule that is as exciting as it is productive.